If you missed 4628 - "Fun With Bricks" on Black Friday at Walmart, it's back starting this Sunday. As a part of "Green Monday," (I had never heard of it), Walmart is making its 10 most-purchased Black Friday items available again. The press release was vague, but it said that items will be available online starting Sudnay. The brick box will be $15, which is the same price* as Black Friday. *The asterisk is because most people were able to get the box for $10.50 due to the early activation of the 30% off LEGO deal. So Wal-Mart has now had a few days to realize it overbought on certain items, didn't hit their target sales, and are doing all of us a "favor" by giving us a chance to buy something almost everyone was able to buy already. Too funny! @DavidBrickley - It could be a combination of overbuying and intentionally buying deep so they could continue with promo offers. Before the holidays, Walmart did say that they bought deeper than ever before, so I'd say it's probably intentional. It's also only 10 items, and they claim it's their top 10 online sellers from Black Friday weekend. Right? I guess it's the "Second Monday of December," which in years past has been the busiest online shopping day in December. This year will likely be Cyber Monday, since it fell in December which it doesn't usually do..
Is that due to people holding their breath for better deals? I thought it was Brown Wednesday after Taco Tuesday. I'm holding out until "light bluish grey Sunday". No, not too soon. Should be Brown Tuesday after Taco Tuesday. Sorry...no colored day of the week joke here....I was just at my local WM...they didn't seem to sell hardly anything on Black Friday. I was just looking...paying no particular attention when I saw a new Super Heroes....Batman: Man Bat Attack So I price cheched...said see associate. Just around the corner they also had the new Friends #41035, #41047, #41039. I figured I knew the prices but I picked up a few and found a gentleman in dress shirt-tie and he was walking around in the toy aisle scanning stuff....I'm assuming a store manager. He had mentioned the B.F. deals on LEGO and I said I know...I missed it and he mentioned that WM is having another one for LEGO before X-Mas. He wasn't sure about the % of discount but it'll be advertised again similar to BF. #41039 Good Lord, my eyes! Not pink, not purple, it's magenta! I was at TRU today and they had #41035 on the shelf and scanned at $37 so I passed on it. But they had #31021 so I got 4 so my wife could have one of each Furry Creature. So the new sets are making their way out a little early. I think after Amazon's Price matching I think that retailers are having a hard time selling stuff in stores. It is much simpler to order online for stuff like toys. I will buy a couple more at that price, and I like that the box top is a brick sorting tray. But hate how all the wal-marts near me have no working price scanners. I have doubts that this upcoming Monday will yield better deals. Not as widely known, but you can also use the gift registry scanner, the computer monitors at the Electronics/Cell Phone counter, and sometimes the computer on the Paint Mixing station. Saw #31021 and #31025 at Walmart today. I may have to go out and check WalMart this weekend then. I absolutely love the new animal sets. 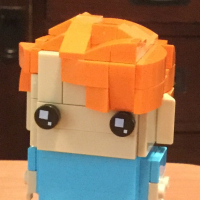 That to me is what LEGO is all about! ^They are also BOGO50 at TRU. ^Yes and the price has already been inflated. I just love the title of this thread: Monday starts on Sunday. Lovely. Thanks for the tips! I had forgotten about the Wal-Mart app. The new Friends sets look fantastic. But our crappy WM rarely has anything new on the shelves, and never has CMS or polybags. A real bummer for sure. Will try the phone app because I never know the real prices there. Thanks! Walmart.com has Minecraft The Village 21105 for $27.98, free shipping if you order 2. This has been in and out of stock but this is a good price. Sorry, went out of stock during checkout, still appears to be huge demand for all three sets. 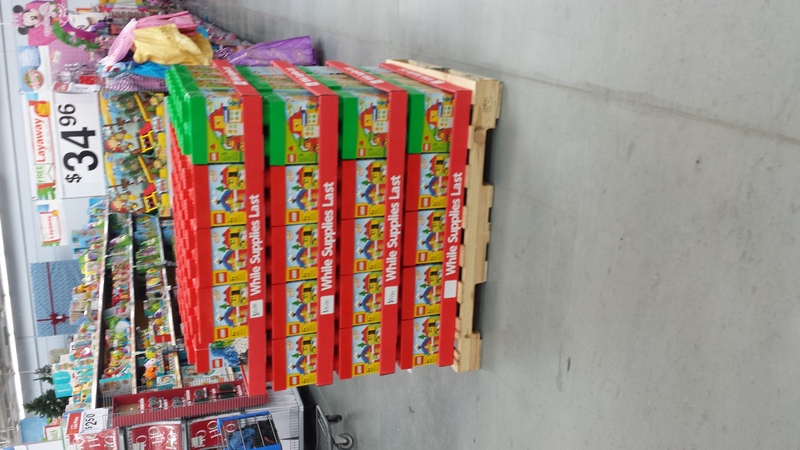 My local Walmart got their Black Friday pallet late... This was taken last night. ^ that will be an awesome Dec 26 pickup. Lucky you! ^^ When you say 'pallet' you mean.... err 'pallet'. That is an impressive industrial look. Last time I got something delivered on a pallet like that it was bricks too, except they were real bricks. For whatever reason I've never seen a wooden pallet in any of the WM's I've been in. Thanks for the info Margot. I had a feeling TRU jacked up the price. The $15 is live now, if anyone needs any. Funny, it is available for both $25 and $15....tough choice?! I picked up a couple for the $10.50...even then for some reason I still wasnt that excited....but they will make great foundation blocks for MOC's and easy Birthday presents for the future.The lids are great and i'm trying to think of something neat to do with them. I just grabbed one @ $15.00. Would have been much more excited to find them at $10.50 BF price, but I'm sure I can find some use for them. There was a green lid version? Looks like only a dozen or so green ones on the pallet though. is the Duplo one on sale also or just the Regular red lid one? I got one of each last night for $15 each. Duplo is out of stock and not on-sale online.